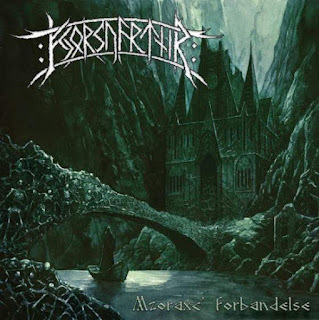 Fjorsvartnir are a solo project from Denmark that plays a very melodic and pagan form of black metal and this is a review of his 2015 album 'Mzoraxc Forbandelse" which was released by Grom Records. Nature sounds and acoustic guitars start off the album along with some atmospheric synths a few seconds later which also mix in with the heavier guitars a minute later and all of the musical instruments have a very powerful sound to them and when vocals are utilized they are done in more of a grim black metal style. Most of the tracks are long and epic in length and the solos and leads that are used on the recording remain true to melodic style of pagan metal and when the music speeds up more of a raw black metal style finds its way onto the recording along with a decent amount of blast beats and death metal growls can also be heard in certain sections of the recording. In some songs a small amount of spoken word parts can be heard and as the album progresses clean playing can be heard at times and they also bring in a brief instrumentals and some of the songs also bring in a great mixture of slow, mid paced and fast parts and a couple of the tracks also brings in a few seconds of operatic female singing. Fjorsvartnir plays a musical style that takes a melodic style of black metal and mixes it in with the more atmospheric side of pagan metal to create an album t hat is very grim while still having a great amount of melodies, the production sounds very heavy and powerful while the lyrics are written in Danish and cover Northern Mythology, Vikings and Battle themes. In my opinion Fjorsvartnir are a very great sounding melodic pagan/black metal project and if you are a fan of this musical genre, you should check out this album. RECOMMENDED TRACKS INCLUDE "Ravniskrig Og Ulvehyl" "Mzoraxc - Modet Med Underverdenden" and "Det Sidste Slag". 8 out of 10.